Frame your float in style. Stapled around the skirt base, our fringe attractively conceals the wheels and undercarriage of your float. Highlight displays, trophy cases, gym entrances, fences, bleachers, and more! Available in 14″ drop by 10′ length in all vinyl and metallic colors. Buy this product now! Our Extra Long Fringe is perfect for trailer sides, hanging 30″ off the ground. The 3′ wide sections make it easy for ‘one-person’ decorating jobs. 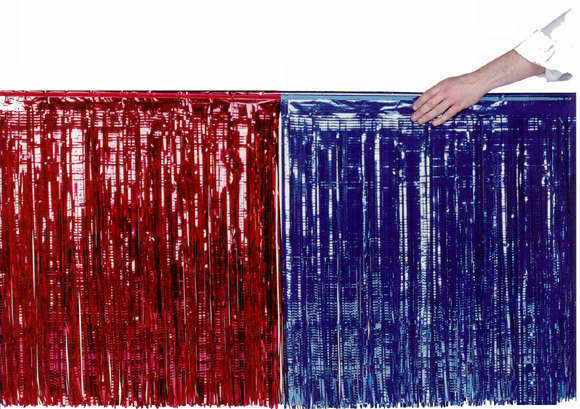 If clearance is less than 1″ off the ground, simply give the fringe a “haircut” – trim it over newspaper and save the trimmings as confetti for your post-parade party! (Available in metallic colors.) Buy this product now!